Kazimir Malevich was recognised by a large retrospective exhibition at Tate Modern less than a year ago. It was an interesting and intriguing exhibition which I reviewed here at the time. Now we have a second exhibition, at The Whitechapel Gallery, which builds on Malevich’s legacy. 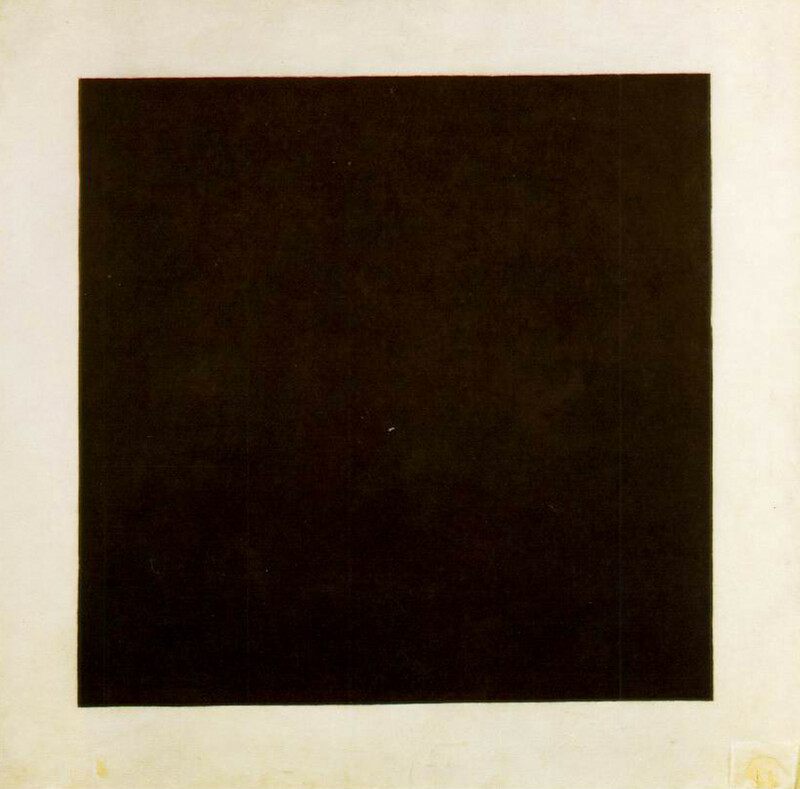 Adventures of the Black Square takes Malevich’s Black Square picture as a starting point for an exploration of the development and spread of Geometric Abstraction over the course of the C20. Iwona Blazwick, who has edited the comprehensive catalogue of the exhibition, defines Geometric Abstraction as “characterised by pure forms based on mathematically defined systems and monochromatic and non-representational surfaces”. She is also clear that the emergence and promotion of Geometric Abstraction has always been closely linked to what she rather gently calls the “utopian impulse”. This very unthreatening phrase actually masks an aggressively revolutionary intent. The desire to create a new form of art which owed nothing to the past traditions and legacies of Western art cannot be separated from the desire to create new forms of political and social organisation. And whilst Geometric Abstraction became a global art movement it is no coincidence that it was forged in Russia during the events leading up to the Russian Revolution in 1917. At its heart Geometric Abstraction is not an aesthetic movement, it is a political movement founded on a rejection of everything which had gone before. As Karel Teige put it “Liberation from traditions and prejudices: overcome the archaism, the academic approach and exclude decorativism”. 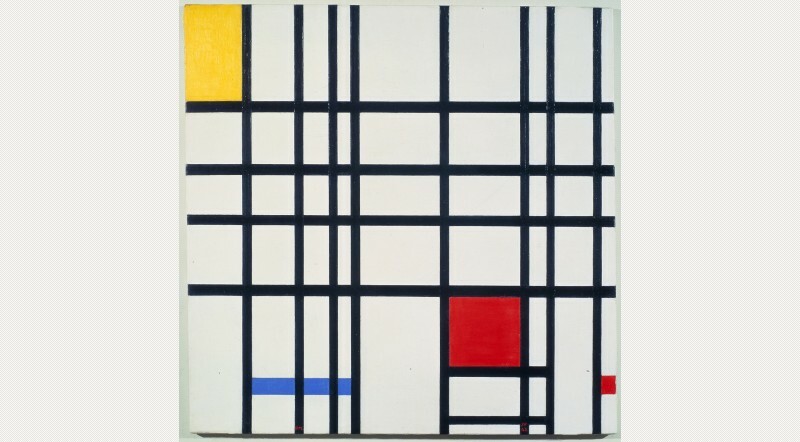 Mondrian was a founding member of the De Stijl group in the Netherland who believed in using Geometric Abstraction to support the synthesis of engineering, art and architecture. Mondrian created rectilinear planes of primary colours which could operate two or three dimensions to create paintings, furniture etc. 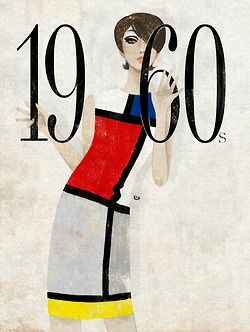 Within 25 years, Mondrian’s images had been successfully appropriated by the fashion industry. Cool certainly, but revolutionary? Not really. As the Whitechapel exhibition very successfully makes clear, the utopian impulse was fertile ground for artistic development and the ideas of Geometric Abstraction spread quickly. There are few parts of the world where there have not been artists working under its influence and the exhibition has pulled together work from every continent. And the influence of Geometric Abstraction went much wider than painting. The exhibition suggests four core themes; Utopia, Architectonics, Communication and The Everyday. The moment has also endured throughout the C20 and indeed still has currency today. The exhibition feels a little anarchic and chaotic with large numbers of works it a limited space, but as a source of stimulation, making you think, it essentially works. There is a lot here to intrigue, amuse and sometimes frustrate the viewer. 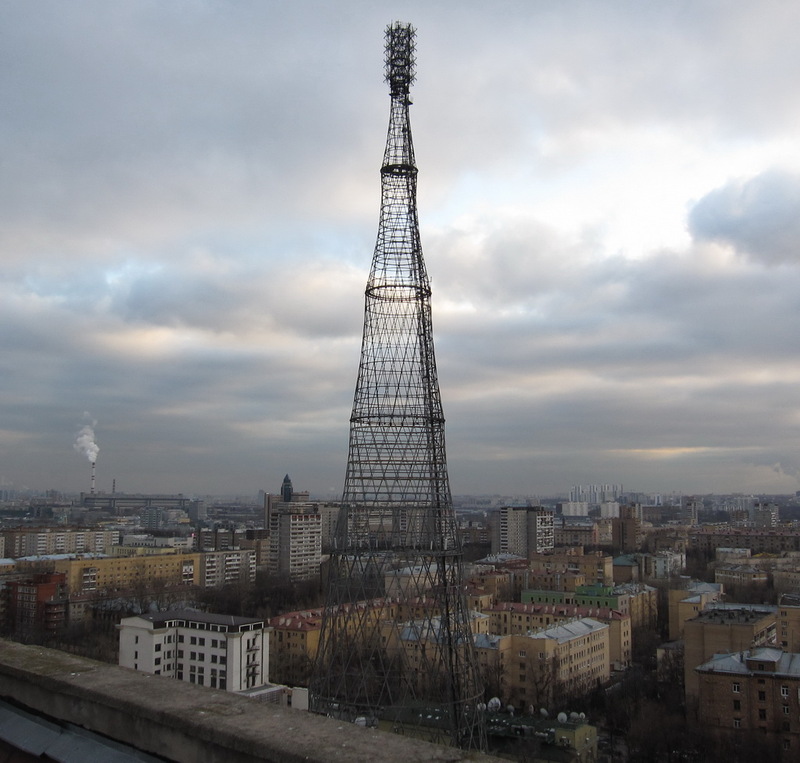 Shukhov’s tower is a powerful demonstration of the impact of Geometric Abstraction both as a source of the engineering design of this tower and position the Geometric Abstraction design as the very essence of broadcasting a message of social change to a mass audience. Indeed Geometric Abstraction had a lasting influence on the architecture of Moscow. 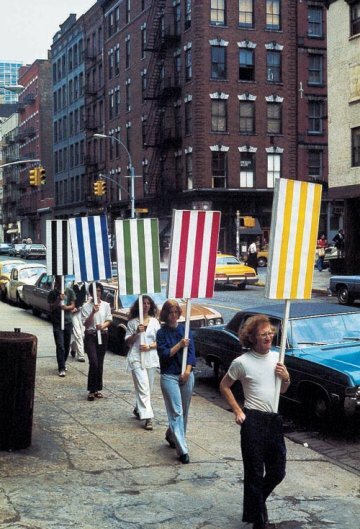 Dancers carrying placards of Buren’s striped paintings seek to reclaim the social ambitions of Geometric Abstraction, taking it into the streets. The strip was defined as form of resistance, and they were also pasted on top of advertising posters to ‘silence the siren calls of capitalism’. What I felt was missing from the exhibition was a description of the parallel development of Geometric Abstraction and the political value system on which it was premised. Because there is a great irony at work here which is not really presented to a visitor to the exhibition. The irony is that the utopian ideals on which the movement was based were comprehensively rejected by the revolutionary movements in which they were forged; revolutionaries have no time for utopians. Utopians can only exist by mobilising market forces in liberal, capitalist democracies. So while revolutionary fervour has no time for the idealism of abstraction, it found under the umbrella of Modernism a comfortable home in the capitalist system. Indeed, from challenging the establishment, Modernism has become the establishment. Such delicious irony is well worth being fully and directly explored and enjoyed than this exhibition allows. 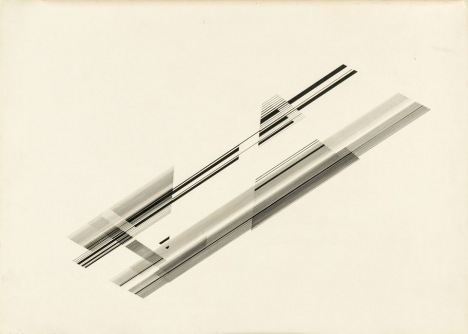 Mohamedi (1937-90) was a pioneer female Indian artist whose work references both Geometric Abstraction and Islamic patterns. Posted in Art, Exhibition Reviews and tagged Black Square, Buren, Geometric Abstraction, Malevich, Mondrian, Shukhov, Whitechapel Gallery. Bookmark the permalink.